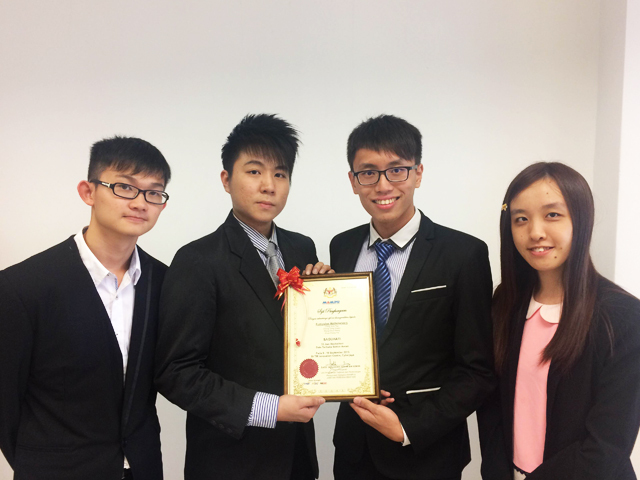 Students Chong Yong Shean, Ching June Tao, Wong Chun Weng, and Chua Khang Hui took home fifth place for their web application, “Air Kita” at the 33-hour Hackaton competition held at TM Innovation Centre, Cyberjaya on 9 to 10 September 2015. “Air Kita is an application we created to educate the Malaysian public on water usage. Some of the features included are tips for saving water, predicting rainfall, water levels, and a water usage calculator,” said Chua. “It is a great opportunity for us to practice what we have learnt in school, and also challenge ourselves by using our existing knowledge to improve the lives of our fellow Malaysians,” said Ching. Wong and Chong said learning to be good team players was crucial in delivering high-quality solutions for members of the public. Participants are required to create an application in 33 hours with 363 sets of data from 17 ministries and 10 sectors that are provided on the government’s public data portal. Wong, Chua, and Ching are Applied Mathematics students, while Chong is currently pursuing her Master of Engineering Science. This competition was jointly organised by Unit Pemodenan Tadbiran dan Perancangan Pengurusan Malaysia (MAMPU), Telekom Malaysia Berhad (TM), GITN Sdn Bhd (GSB), and Multimedia Development Corporation (MDeC). This was one of the initiatives by MAMPU to develop Malaysian youths using data to increase organizational efficiency, and to improve the quality of public service delivery through informed decision making. It was participated by 52 groups consisting of 168 participants, including civil servants, students from institutes of higher education and information technology communities, and companies.